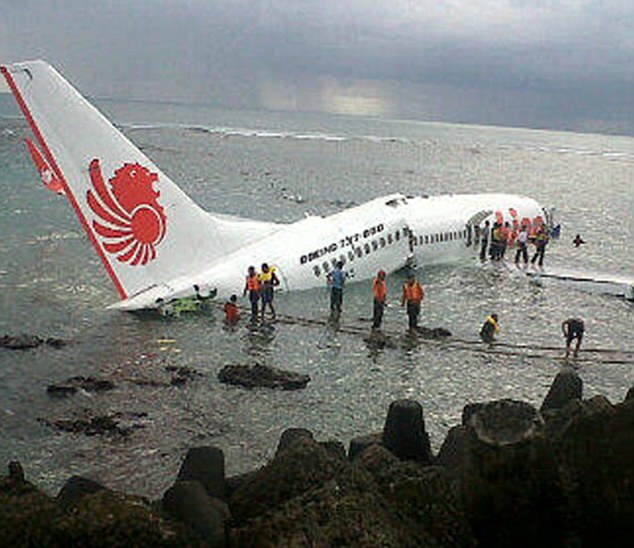 A PASSENGER plane carrying more than 100 people has crashed into the ocean off the coast of Bali. 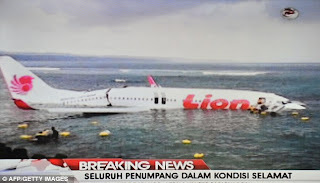 The Lion Air craft is believed to have slid off the runway and into water outside Ngurah Rai Airport, near Denpasar late this afternoon. 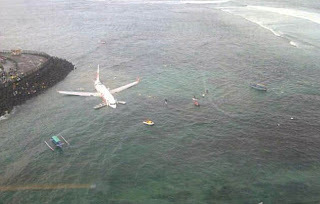 A large crack was clearly visible on the plane as it sat swamped by water about 6pm (AEST). It was not immediately known if any Australians were on board or if the broken fuselage was caused mid-air or on impact. 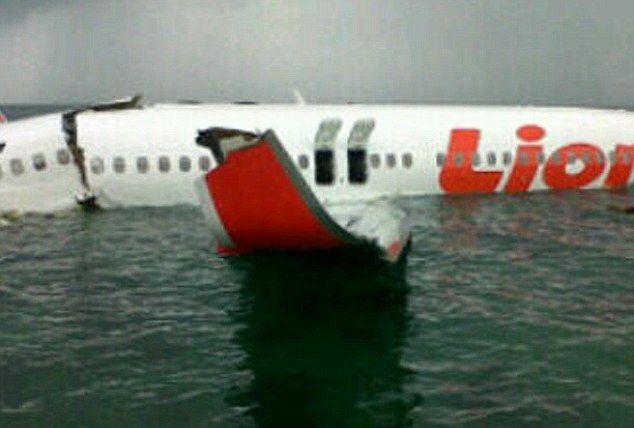 Early reports from Indonesia indicated passengers and crew had survived the crash and been relocated to a nearby hospital. The plane was travelling from Bandung in West Java to Denpasar when it experienced trouble, AAP reported. Initial reports suggested the plane may have overshot the runway. 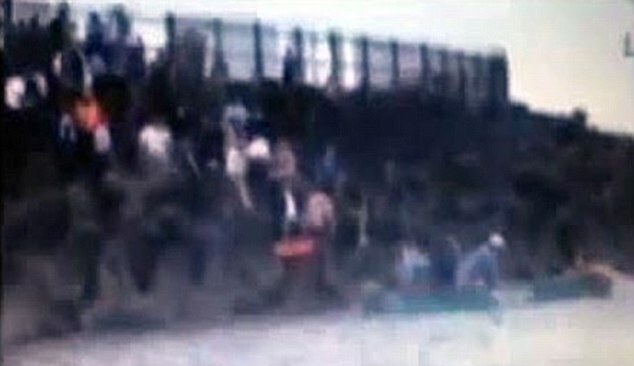 The Department of Foreign Affairs and Trade said it was not aware of any Australians on board. Passenger Santy Wiastuti, who was being treated for leg injuries at Kasih Ibu Hospital, said there was no warning of the impending crash. 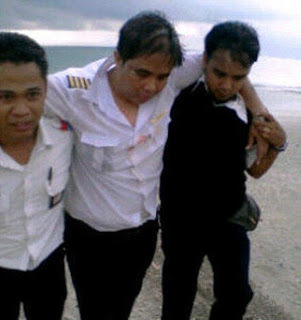 ''There was no signal, anything, it just happened suddenly,'' Ms Wiastuti told News Ltd. Early indications are that there are no deaths and that all on the plane survived. 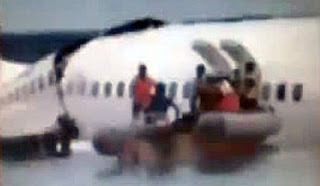 Authorities are still trying to ascertain if there were any Australians on board. 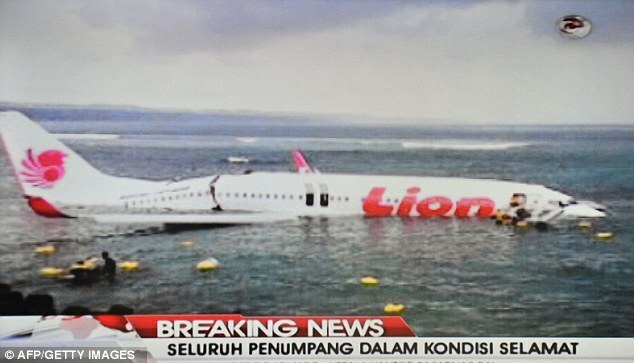 Lion Air commercial director Edward Sirait said some passengers had been taken to a hospital in Denpasar. "All passengers and crew are safe, 101 passengers and seven crew. They've been taken to the nearest hospital,'' he said. "The plane is Boeing 737-800 NG, Next Generation. It's a new one, a 2012 product,'' he said. Hospital officials and paramedics said at least seven passengers were taken to Sanglah Hospital with head wounds and broken bones, the Associated Press reports. A spokeswoman with the Department of Foreign Affairs and Trade in Canberra said efforts were being made to ascertain whether any Australians were on the flight. "The Australian Consulate-General in Bali is making urgent inquiries to determine whether any Australian citizens may have been involved in air crash is Bali on Saturday afternoon,'' the spokeswoman said. Passengers said on Facebook they were stranded at the airport. 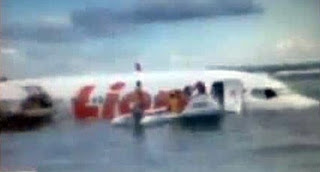 "A landing plane has overshot the runway and ended up in the water," one tourist, from Perth, said. "As a result, the whole airport is closed and we're stranded."